So last time we were talking about timing your arrival at an event in order to get the most out of the activities, and understanding the difference between the mindset of longer and shorter events. At shorter events most people set up a fairly minimal camp because the attitude is “it is only for a few days”. 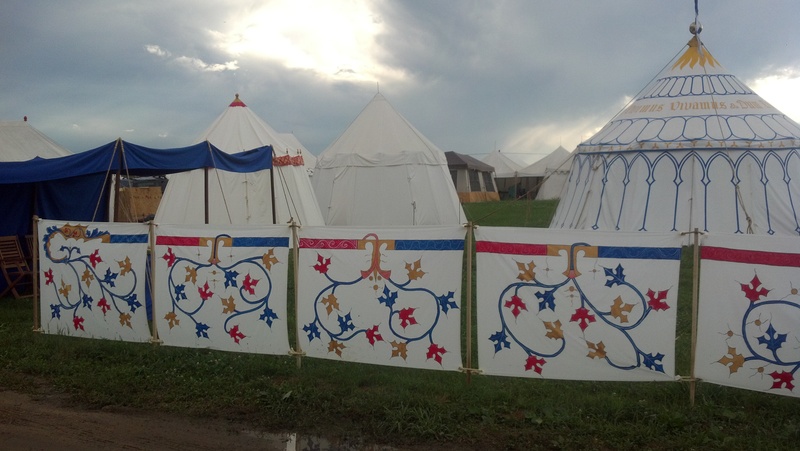 At longer events, like Gulf Wars and Pennsic, people will take the time to set up much more elaborate camps, complete with gates, walls, showers, and other amenities. Some larger households have “teams” that come for set up and spend several days just building the infrastructure for the rest of the camp. As someone who has been a part of one of those teams, I can tell you that for the folks who come in later it is almost like “hoteling it”. All you have to do is set up your own tent and all of the communal facilities are already in place. But none the less, whether you are with a larger household, or a small encampment, if you are camping you have this “base of operations”. A place that you can go back to on site, that has some comforts like cold water and a snack, and a comfy chair. You can decide to take a short nap, or do some crafty thing, and if you are camping with others, there is a significant chance that you will bump into a camp mate and have someone to chat with. Hoteling it without an onsite base of operations means that you have to haul everything that you need with you at all times. If you drove to the event you can still bring a fair amount of “stuff” with you – like chairs, a cooler, and a wagon to haul it all in. You can use your car as a storage locker, which obviously has its issues if it is particularly hot, or if the security at the site is not great. Parking is also often “out in the north 40”, which can make those trips back to the car a serious chore. If you fly to an event you either have to rely on the good will of friends who are at the event, or buy things that you will leave at the end of the event, or do without. As you can imagine, all of these options have issues. If you have a rental car you can still use it as a storage locker to keep spare drinks and crafty bits so that you don’t have to carry everything all of the time. But again your parking spot may be a long distance from where you want to be for activities. This entry was posted in Camping, SCA Life and tagged hoteling it, Long events by Eirny. Bookmark the permalink.